First off, this question is basically impossible to answer. 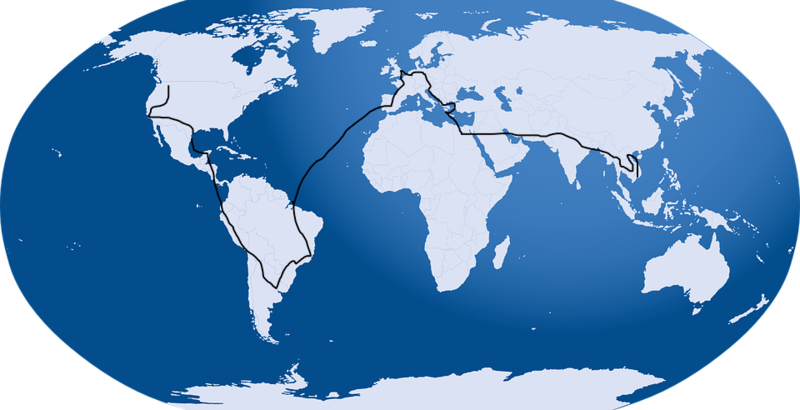 We loved all the countries we visited, (although Peter may argue otherwise after our experiences in Peru), and each one definitely changed us for the better. Since we can’t give a genuine single answer to this question, and it really depends more on the interests of the person asking anyway, we’ve compiled a list of our favorite destinations from the trip by category instead. We hope it helps you pick your next getaway! You can find some of the best (and cheapest!) scuba diving in Koh Tao. The beaches are clean and lined with fun restaurants and bars. 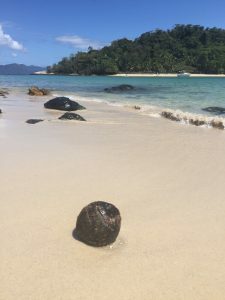 Aside from amazing surfing, we found countless secluded, breathtaking beaches here. If you prefer beaches hopping with sunbathers and bars, check out Copacabana or Ipanema beach in Rio de Janeiro. We saw the whitest sand and bluest water in Cancun (albeit, more people). If you love swimming, Mexico is also amazing for it’s countless cenotes, or underground cave swimming. One of the many breathtaking beaches in Brazil. This was on a boat trip near Ilha Grande. And yes, that’s a coconut. Thanks to our friends Cynthia and Alexis, we experienced some of the best food Paris had to offer. We gained about 10 pounds each as we scarfed down pain au chocolat (a croissant with chocolate inside), eclairs, crêpes, beef tartare, escargot, and so much more. It makes me hungry just thinking about it! There’s a reason Argentina is known worldwide for the best steak and wine. Peter wrote an entire article about a four hour asado (barbecue) we attended that was one of the best dining experiences we’ve ever had. Tapas, tinto de verano, paella, oh my! We could not get enough of the amazing food in Spain. We experienced awe every time they brought out free tapas (similar to small appetizers) when we ordered a drink. Our favorites included crab cakes, potato pancakes, and Spanish meatballs. The Middle Eastern food in Granada was also exquisite. Peter claims he could live off only Indian food for the rest of his life. We ate vegetarian for our entire visit there, and the flavors were so unique and delicious, we didn’t miss meat for a minute. 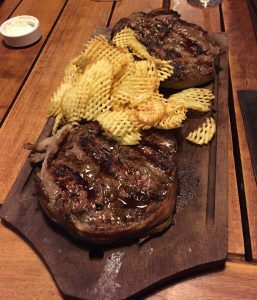 We couldn’t resist the steaks in Argentina. Cambodia is one of the countries that stuck with us the most after our trip because the people are so dang endearing. Playfulness and fun teasing seem to be a common personality trait shared by most of the Cambodians. Canada lives up to its friendly reputation. Aside from meeting several kind Canadians on the road in various hostels, they welcomed us with waves and smiles on our final flight to Calgary. Nearly every worker we came across from the security guard to our hotel driver was up for a good chat. Like Montana, in Canada it seems easy to strike up a conversation with strangers anywhere. Some of our best accommodation experiences came out of Turkey. The locals there have a knack for making you feel like you’re one of the family. They’re genuine, hard working, and willing to go out of their way to make you feel comfortable. Check out my confessions post on Turkey to see what I mean. Despite how awful our country has treated (and continues to treat) Mexicans, Peter and I never felt any hostility from the locals. In fact, we received nothing but kindness from them. Mexicans are hard working, friendly people that make tourists feel at home. Walking off the plane, free tour guides greeted us with maps and suggestions for places to see and things to do. We can’t wait to go back. It’s always important to learn a little of the local language when you visit a place, but that is especially true for Greece. Even if you just know the essentials like “hello” and “thank you,” the Greeks will be so appreciative, they’ll pull out all the stops for you. When we visited the island Poros a few years ago, the owners of our hotel upgraded us to the suite when they found out Peter spoke some Greek and worked for a Greek family. This time around was no different. Our Airbnb host surprised us with homemade wine, Christmas cookies, and coffee when we rented from her. The Greeks know how to take care of you. The Cambodians were some of the most playful, funny people we met on our trip. 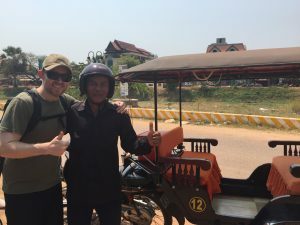 This is Peter with our Angkor Wat driver Pern. When we visited, the exchange rate was 18 pesos to 1 USD. 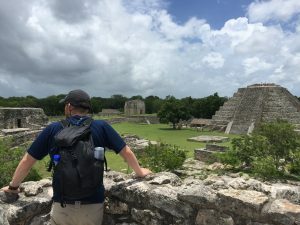 See my post on how we visited Mexico for $35 USD per person per day for more specifics. Thailand was a little more expensive than we had heard, but it was still incredibly affordable. It’s a great place to splurge, yet not break the bank. They have entire streets filled with Thai massage parlors that cost as little as $8 an hour and the cheapest scuba diving in the world. Due to rampant inflation, the Argentine peso is currently $16 to $1 USD. 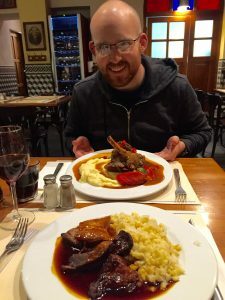 We heard Argentina was one of the more expensive destinations in South America, but we still found it easy to splurge on chocolate, wine, and fancy steak dinners for less than $55 per person per day. If you’re set on going to Europe, Spain is the best bang for your buck. It is one of the more affordable countries in Western Europe, yet it still offers spectacular buildings, great food, and interesting things to do. For more details, see my travel guide on the best of Spain. Czech Republic was a bit more expensive than we had guessed, but its costs still fall well below Western Europe while rivaling it in beauty, food, and culture. There’s a reason it keeps popping up as one of the most photographed countries in Europe these days. The value of the Egyptian pound recently crashed making 1 USD worth 18 Egyptian pounds. The extremely low cost of everything kept us in a constant state of shock, from $3 for a 45 minute taxi ride from the airport to a suit valued at $700 for only $100 USD. This gourmet meal in the Czech Republic was one of our favorite meals on the trip, and it only cost about $26 for both of us, including drinks. If towering mountains, glacial lakes, deep canyons, and vast deserts are your thing, take a closer look at Peru. We didn’t get to see all of this with our own eyes because I got sick, but we heard about it from other travelers in Peru. Just the mountains jetting up around Machu Picchu are stunning in and of themselves, but there is so much more to explore here that often goes unrecognized. My stomach may have twisted in knots a bit as our little plane descended among the towering mountains of Luang Prabang, Laos, but I couldn’t deny its beauty. 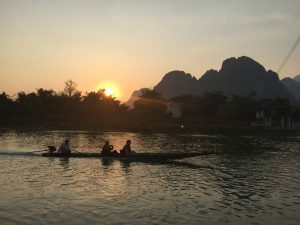 If you’re looking for bustling cities, Laos isn’t for you, but if your dream vacation is in sleepy towns with beautiful scenery, meandering rivers, caves, and waterfalls, Laos is where you want to be. 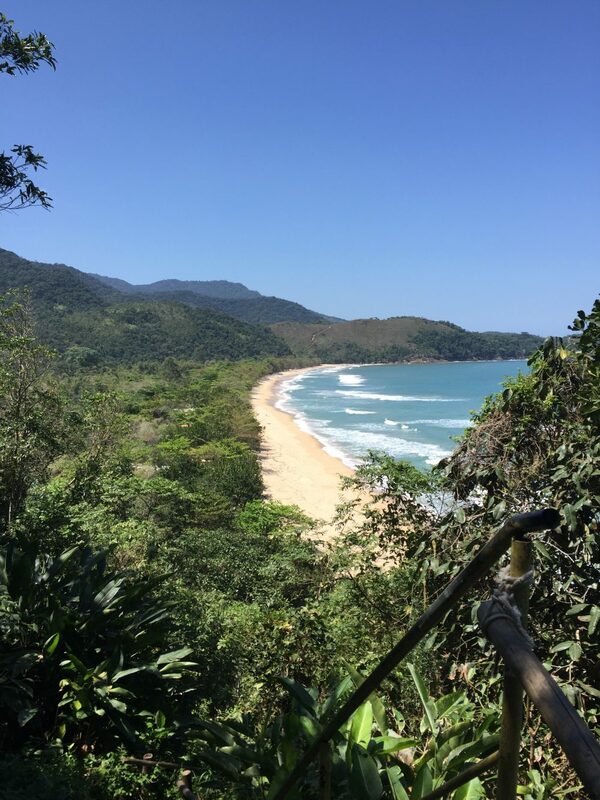 The beaches alone are enough to visit Brazil, but there’s much more to this stunning country than just the sand and waves. I couldn’t peel my eyes from the window as we drove along the highway south of Rio de Janeiro. The jungle covered mountains are a site to behold. Better yet, go inside the jungles to explore the monkeys and iguanas as you stroll along the smooth mud paths to the next beautiful vista. You can’t visit Croatia without checking out its national parks. I’m a sucker for waterfalls, and Croatia didn’t disappoint. Even though we went in the winter and sections of Plitvice were closed for the season, we still couldn’t believe the sheer number of waterfalls there or in Krka National Park. Vang Vieng, Laos had stunning sunsets filled with hot air balloons against a mountainous backdrop. 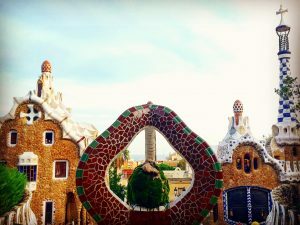 Antoni Gaudi’s work in Barcelona alone is enough to visit Spain, but there’s so much more to see. My jaw literally dropped when I walked into the Plaza de España in Seville. And I don’t think I’ll ever forget the picturesque beauty of The Alhambra in Granada. This one doesn’t require my explanation. Paris has drawn visitors for generations to gaze in wonder at its stunning architecture, such as the Eiffel Tower, the Louvre, or the Sacre Coeur. The windmills or the epic cathedrals in the small villages don’t disappoint either. If I could pick one place for my nervous travel friends to have their first international adventure, it would be Belgium. This has got to be one of the cutest countries out there when it comes to quant little towns with cobblestone streets, delicious chocolate shops, and breathtaking buildings surrounding main plazas. What isn’t their to love about Belgium? If you want something different from the typical fancy architecture we associate with Europe, Thailand is the place to go. I found it fascinating how each culture could have such vastly different ideas for how to construct their buildings and places of worship. Bangkok specifically has some stunning stupas to see around the Grand Palace. Like France, England is internationally acclaimed for its memorable architecture such as Big Ben and the Houses of Parliament. However, we were equally impressed by the juxtaposition of new and old that has developed in London. Looking out the Tower of London, on one side of the Thames you’ll see a fortress built in 1078 and on the other you’ll find several spectacular glass buildings of varying shapes and sizes. You can enjoy tradition and innovation in one place here. Just some of Antoni Gaudi’s unique work in Barcelona. This goes without saying. Who isn’t fascinated by the pyramids, the Valley of the Kings, and hieroglyphics? It still blows my mind that over 2,000 years before the Romans built the colosseum, the Egyptians had completed the Great Pyramid of Giza. You can still see the paint colors on a lot of the hieroglyphics in the pharaoh’s tombs as well. I have no words. Peter and I hesitated spending as much money as we did on a tour of the D-Day invasion in Normandy, but we’re so glad we did. It ended up being one of the highlights of our trip. Check out Peter’s post on our D-Day tour experience to learn more. Obviously, there’s a lot more French history to explore than the American’s involvement in WWII, and more than I could ever mention here, but the Palace of Versailles or the Louvre are good places to start. Sadly, history is not always about victories and proud moments. It also shows us some of man’s darkest hours. Visiting Auschwitz in Poland is not easy, but it’s important. I felt colder walking through the Birkenau concentration camp than I felt the entire trip, and that was after being bundled up with several layers of clothing, gloves, and a hat. I have no idea how anyone survived those temperatures in the conditions they were in. Similar to Poland, Cambodia had a deep impact on us after we saw the atrocities its people had to endure during the the Khmer Rouge’s reign. If you’re unfamiliar with this recent history, read about our experience visiting the killing fields in Cambodia. Cambodia had some uplifting history as well with Angkor Wat, a vast temple complex and the largest religious monument in the world. You can spend several days exploring all the temples, many of which are overgrown with trees in a way that seems almost magical. Everyone knows about the famous Mayan ruins of Chichen Itza, but there are countless other ruins scattered across the country. We visited Mayapan, which was virtually deserted, and visitors are still able to climb on the ruins. The Mayapan ruins in Mexico. Croatia is known as a summer destination; however, we went in the dead of winter and were still blown away. Croatia won the award for the best Christmas markets in Europe and we understood why. Zagreb had the most high quality Christmas markets full of lights, festive snow-capped pine trees, and delicious fritules (basically round mini donuts with frosting or Nutella drizzled over them). Austria’s Christmas markets rival Croatia’s with their epic backdrops. They had one at the base of their stunning city hall (pictured below) and another in front of the Schönbrunn Palace. You walk into a Christmas market in the Czech Republic and get hit with the smells of delicious ham, sausage, and trdelnik (sweet dough coiled like a snake and rotated over a hot fire with a sprinkle of cinnamon and sugar). Despite the delicious meal options, you have the fantastic backdrop of clock towers, statues, and general striking architecture. A list of Europe’s best Christmas markets wouldn’t be complete without Germany. For us, the whole experience of Christmas markets started here. The German polka music, mulled wine, hot chocolate, and gingerbread hearts with cutesy names painted across in icing are only the beginning. 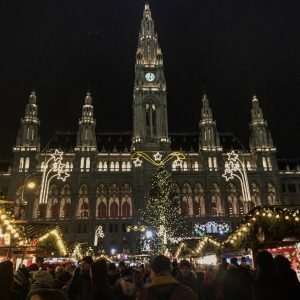 One of the Christmas markets in Vienna, Austria rivaled the best in all of Europe. Regardless of what you’re looking for in a travel destination, we highly recommend any of the countries listed above. Each place is amazing in its own right. The biggest difficulty you’ll face is choosing between them!